Becuase I got the almond in the Christmas rice porridge, I get to make a wish! 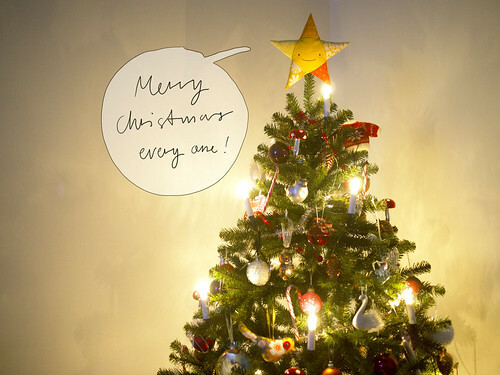 I wish you all have a very merry Christmas and that your days be filled with cheer, warmth and love. Rudolf is really good at navigating, he's the best at map reading out of all of his friends! And he rather likes traveling during Christmas time. 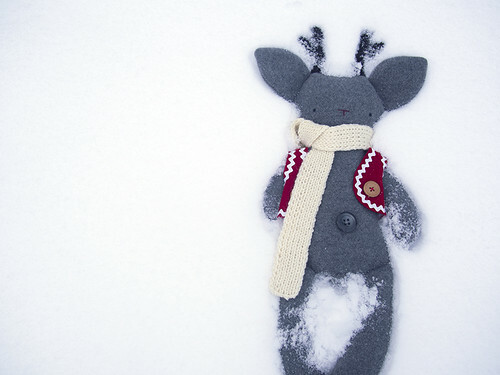 Rudolf is wearing a jolly red felt vest that's decorated with white ric-rac and wooden buttons. He's also got on a warm woolly white knitted scarf. 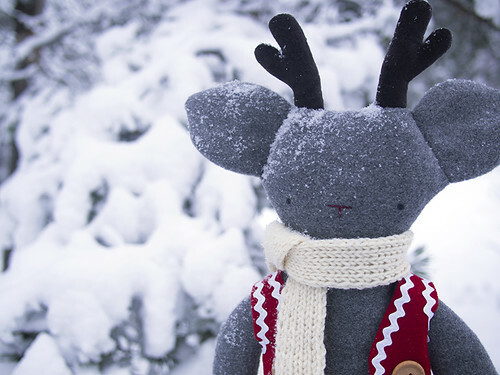 Rudolf is made out of warm grey wool, and he's stuffed with rags and a bit of polyfill. 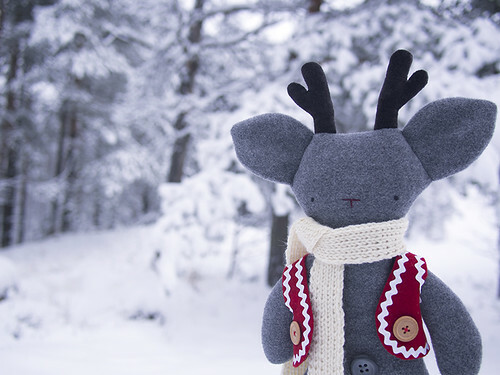 He has little button eyes, an embroidered red nose and velvet antlers. He has a shiny grey button for a bellybutton. Rudolf can be found in the Rag Pet Shop, waiting to go on new winter adventures! ...lucky number 111, Sharon! Yay! I'm sure Lumi will really enjoy relaxing and playing with you and your kids. 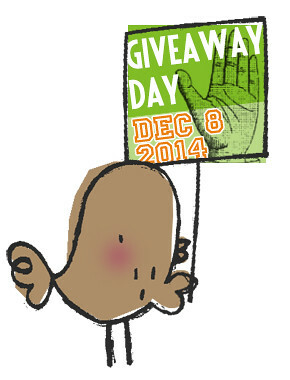 It's time for mistletoe and holly, fancy ties and granny's pies and Giveaway Day! This is Lumi the rag-polarbear. Lumi means "snow" in Finnish, and while we don't currently have even a little bit of snow here yet, that doesn't stop Lumi from enjoying the holiday season one bit! 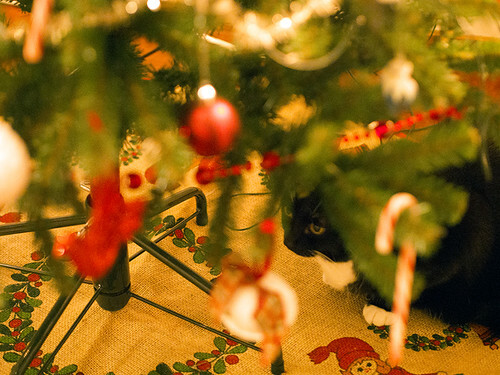 She especially likes sparkly Christmas lights, and looking at all the shops' pretty holiday window displays. Lumi is about 33 cm tall from her toes to the tips of her ears. 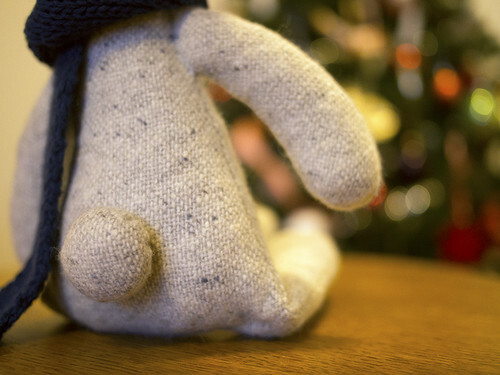 She's made out of soft icy blue wool and she has little button eyes, an embroidered nose, blushy cheeks and a neat blue button for a bellybutton. She's stuffed with rags and a bit of polyfill. Lumi has a tick dark blue scarf knitted from cotton yarn to keep the winter chill at bay. I am giving Lumi away to one lucky commenter who leaves a comment telling me what your favourite thing to do during the holiday season is between today and Friday the 12th. Each commenter will get a number, with the first to comment being number 1 and the second number 2 and so on, and then come the 12th, I'll randomly draw a number to see who Lumi will go home to (I'm happy to ship anywhere in the world, so it doesn't matter where you're from). 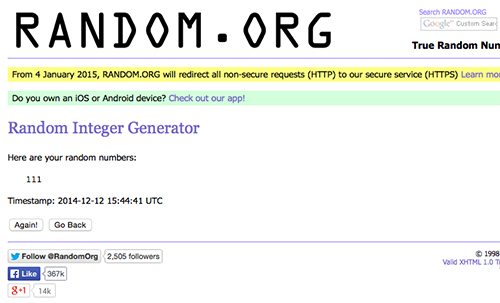 Do look through the whole, long list of wonderful crafters taking part in giveaway Day over at the Sew Mama Sew blog as well! 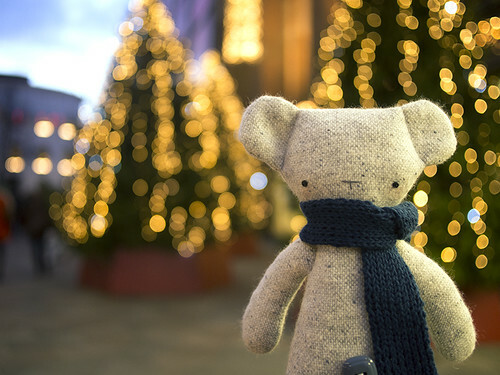 Much like Lumi, I like to go see the Christmas lights and window displays downtown, but my most favourite thing to do at Christmas is putting up my lights and decorations and especially trimming my wee twee Christmas tree. Edit on the 12th of December: Commenting is now closed, and a winner will be announced soon! It's been a very, very long time since I last blogged! I'm not sure if I could catch up or whether it'd even be possible to do so without frankly flooding the place with out-of-date things. In any case, this post is more about moving onto new things and not looking back at the past. 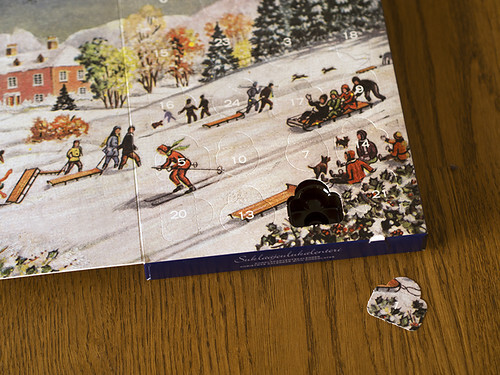 Today it's no longer dark and dreary November, but bright and cheerful December. Even though we don't have even a little bit of snow here yet, the grey gloom outside is made easier to bear with Christmas lights twinkling everywhere, delicious Christmas food to eat and the joy of the season suffusing everything. I put my lights and decorations (and this year even my tree) up today and for me this whole month is filled with a nearly endless playlist of Christmas music and movies and lots of tasty holiday treats. I might go a bit overboard with all this Christmassy fuss, but to me this is a bright spot in the middle of what is otherwise a pretty bleak time of year. In addition to getting to start all things Christmassy, there's something really brilliant to look forward to in a week's time: Giveaway Day! This'll be my 7th time taking part, and I'm really looking forward to it.